FeastHome – Some people love a neutral palette, but you don’t. If that is the case, add a splash of bright color to your kitchen. 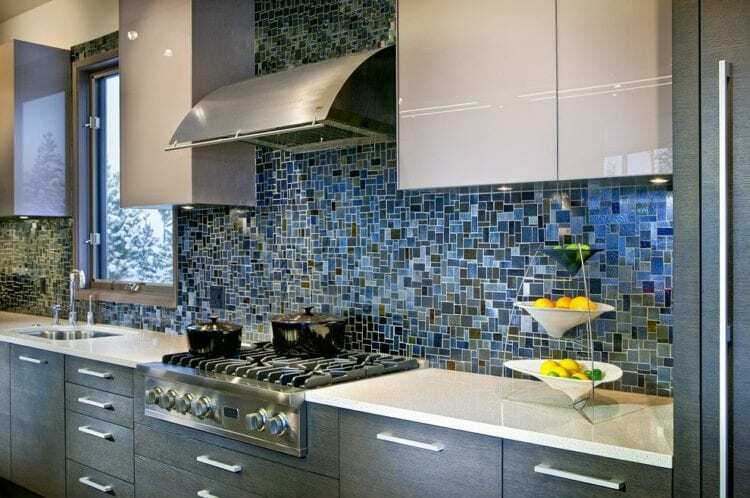 Our amazing blue kitchen backsplash ideas will certainly help you in updating your culinary space. Blue is a really versatile color. That means it can go well with the others. And it fits perfectly in any kitchen’s design. Whether you have a traditional or modern kitchen, take a look at these options. Not a fan of punchy blue shade? Give this idea a shot. 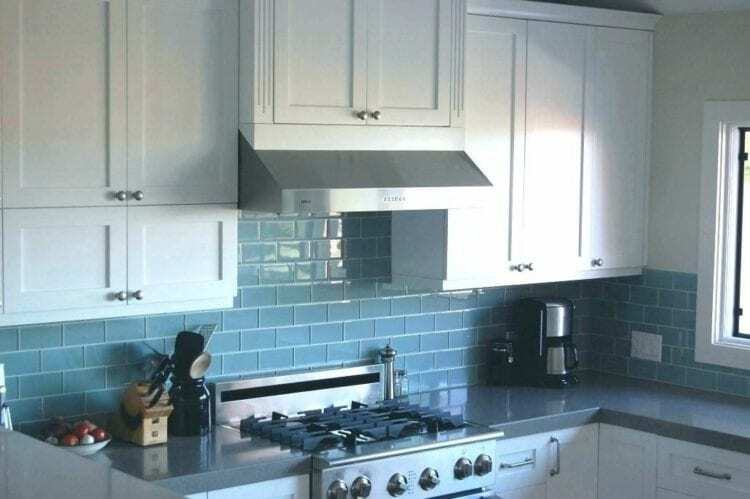 The steel blue subway tiles on backsplash bring a tranquil atmosphere to space. They match nicely with metallic units. There is also a pattern that seems so alluring. The white cabinetry and black quartz countertop evoke the fashionable setting. Complete! For sure, the homeowner gets inspired by the ocean. 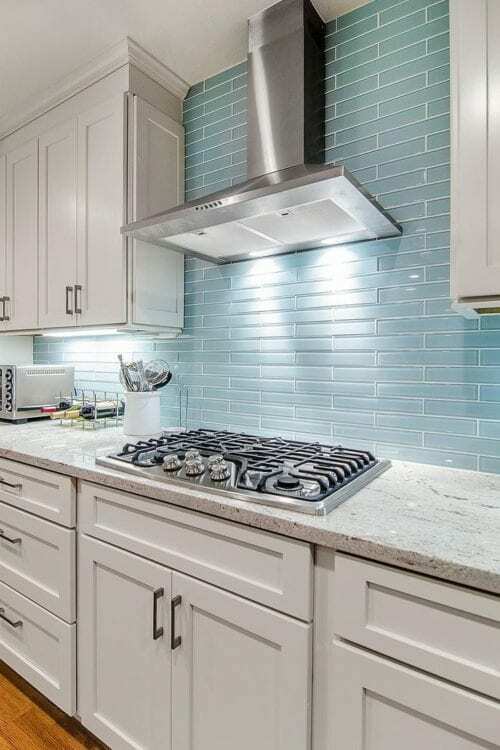 The backsplash tiles come in blue shade. Along with the air force blue countertop, they depict the cheerful vibe. The sunlight shines through glass windows. As the impact, the room feels open and airy. The stripped window blinds catch the eye in no time. If you are not so ready to experiment with bold blue, the subdued one is the best option. As seen in the picture, glossy grayish subway tiled-backsplash creates a mind-relaxing ambiance. The marble countertop is undeniably opulent. Meanwhile, unfinished wooden ceiling, white cabinetry, floor, and stainless-steel pieces inject rustic-industrial charm. 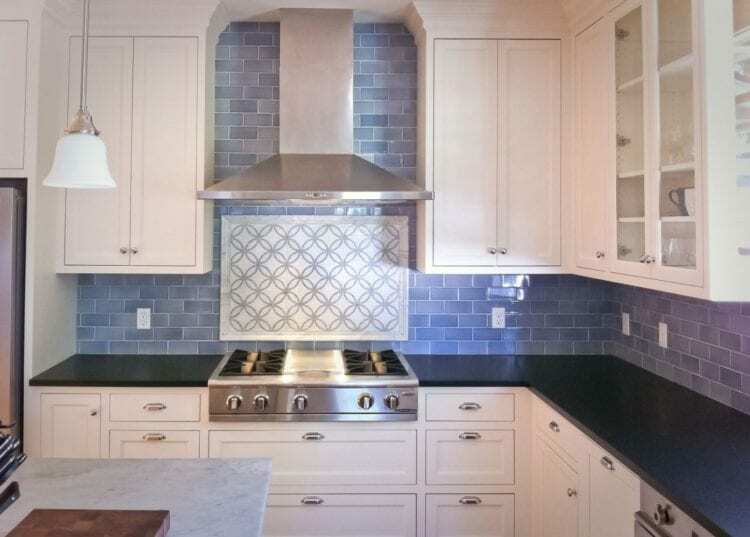 The navy square ceramic tiles on kitchenette’s backsplash develop drama and depth quickly. They also turn the stark culinary space into something elegant. Moreover, the navy drawer knobs and mugs have a similar color. Polished stone countertop sets rustic character. And a floral rug on the wooden floor serves as a focal point. 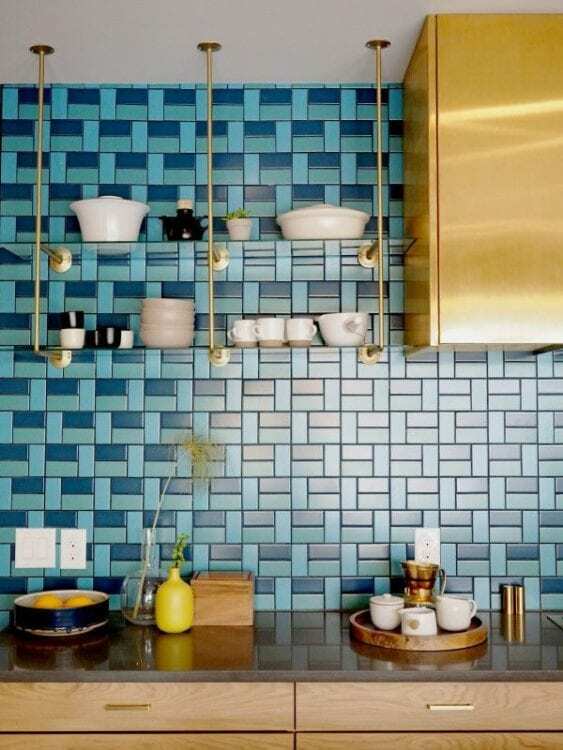 The dweller smartly uses sapphire blue mosaic tiles for the backsplash. They pop against the white worktop and dark wooden cabinets. Two metallic appliances boost a sense of glam. The glass window allows daylight to get into the area. A couple of retro pendant lights illuminate the cooking space after dark. Most people choose subway tiles because they are seriously affordable, flexible and classic. So, why not follow the same route? 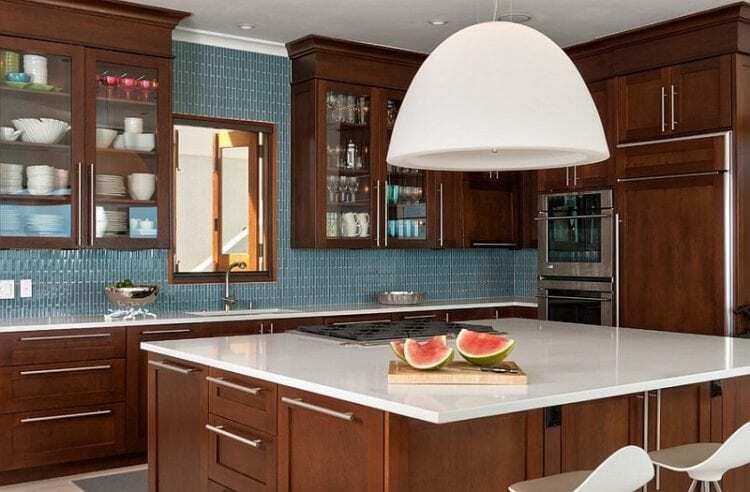 In this culinary space, the stone blue subway tiles cover backsplash vertically. With their help, the squatty zone appears visually high. The wooden cabinets exude warmth and intimacy. We just can’t stop seeing this picture. 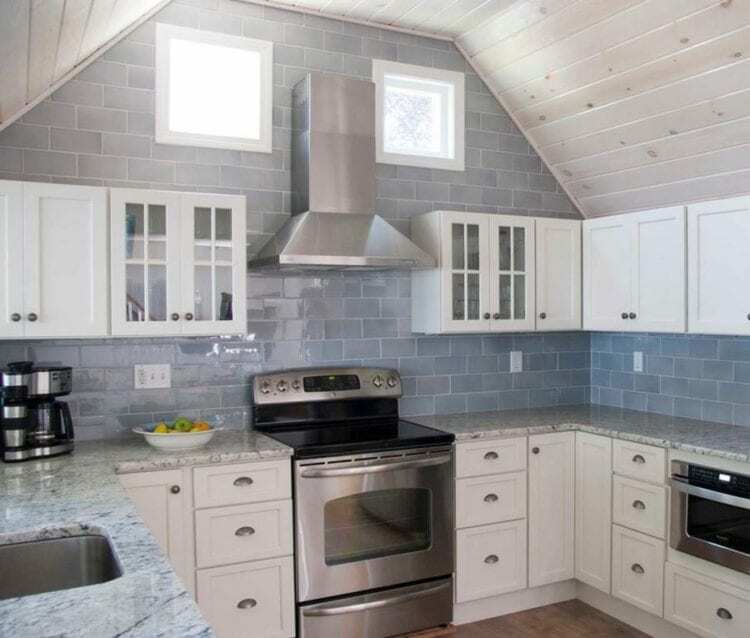 The kitchenette features a backsplash created of thin subway tiles from baby blue to navy. They unexpectedly generate visual interest. The wooden cabinetry promotes rustic appeal. White countertop, kitchen island, and dishwashing machine contrast divinely with the cabinetry. A window connects the kitchen with surrounding nature. This cooking area seems so fresh and sophisticated. 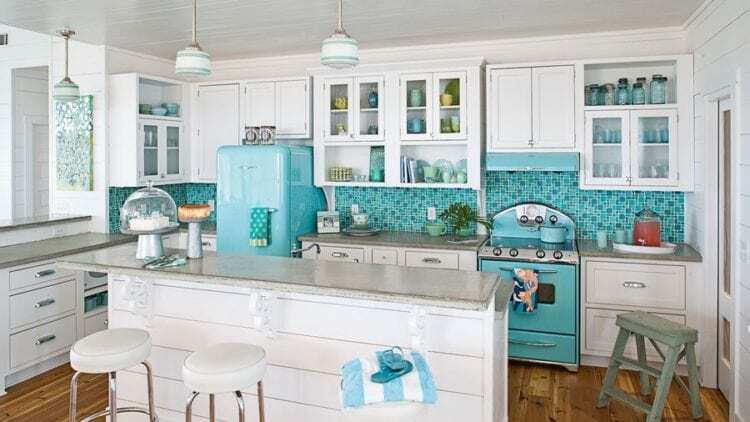 Thanks to the turquoise backsplash, cooker and refrigerator. Even, the pendant lamps and fabric on stool showcase the beauty of turquoise and white. The rest of the room is kept bright. While the wooden floor delivers a touch of nature to the kitchen. 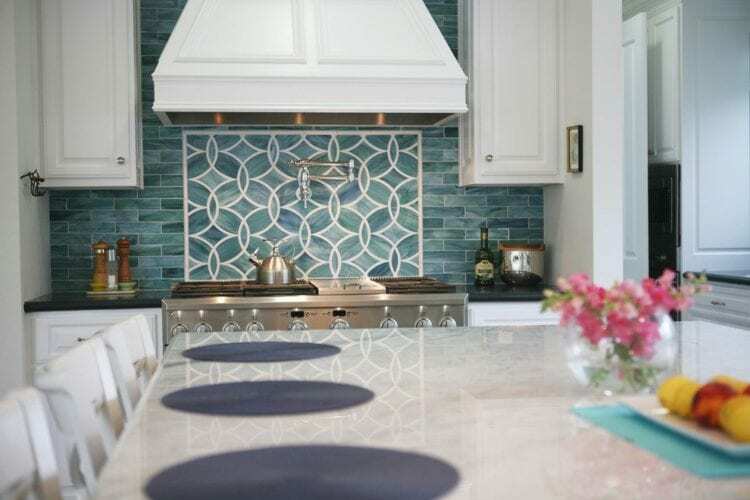 The blue Arabesque tiled-backsplash effortlessly gives the kitchenette’s interior design an exotic vibe. Not to mention, the white grouts highlight the tiles. In addition, the well-defined lines of countertop and cabinets balance out the curvaceous shape. An antique scale steals the spotlight. The rosemary freshens up space. 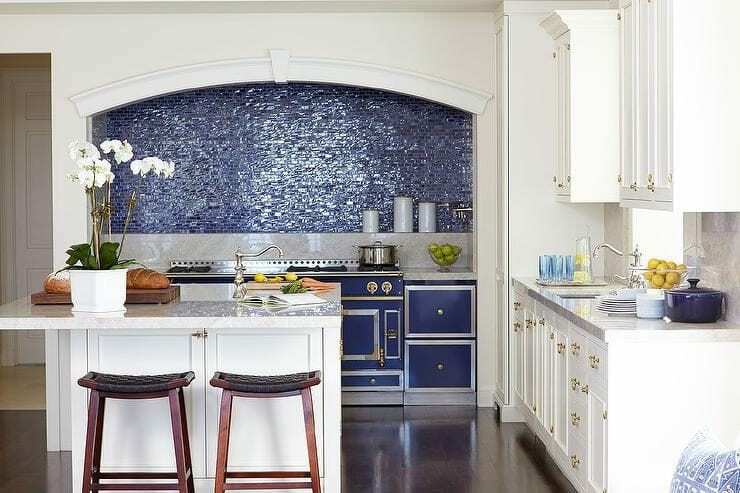 Here, the blue glass tiles on backsplash soothe the whole area. They look standout against the white granite and cabinetry. The metallic kitchen appliances exhibit the macho character in no time. And the wooden floor warms up the culinary space. We guarantee no one has the kitchen like yours. Think that mostly white cooking space is monotonous? Think again. 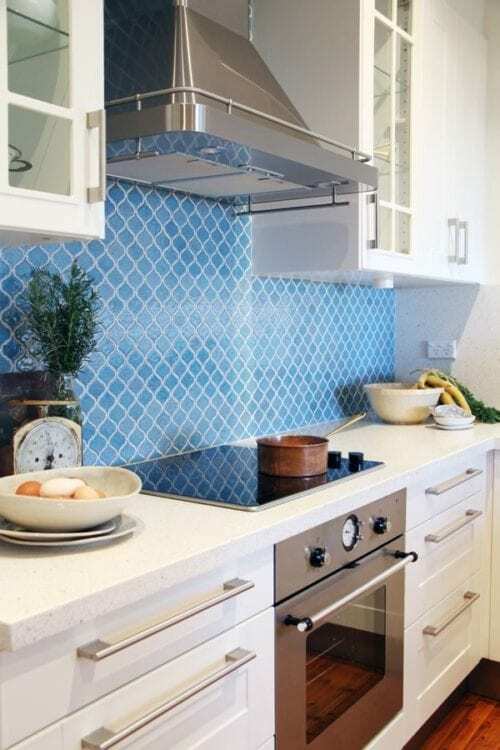 With the sparkling light blue tiled-backsplash, the kitchen seems more ravishing. The white cabinets carve modern aesthetic. While the stainless-steel drawer knobs and countertop channels the masculine spirit. 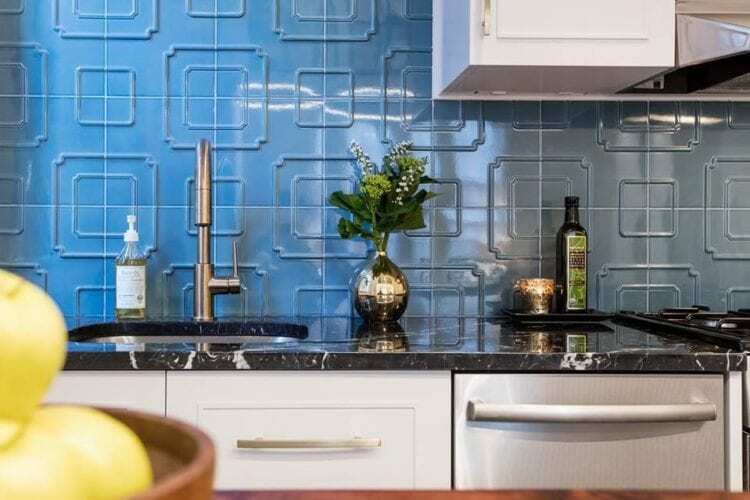 The slate blue embossed backsplash grabs the attention and provides rich texture. It works stunningly with black marble countertop that infuses timeless luxury. Fresh flowers in the metallic vase bring lively life to the kitchen. Lastly, white cabinets lend the cooking area a stylish appearance. Want a minimalist and glamorous kitchenette? This idea is definitely for you. Here the three-tone backsplash looks aesthetically pleasing. The golden cabinet, shelf support brackets, dining wares, and drawer pulls create a posh air. Yellow vase and houseplants rejuvenate the entire space. 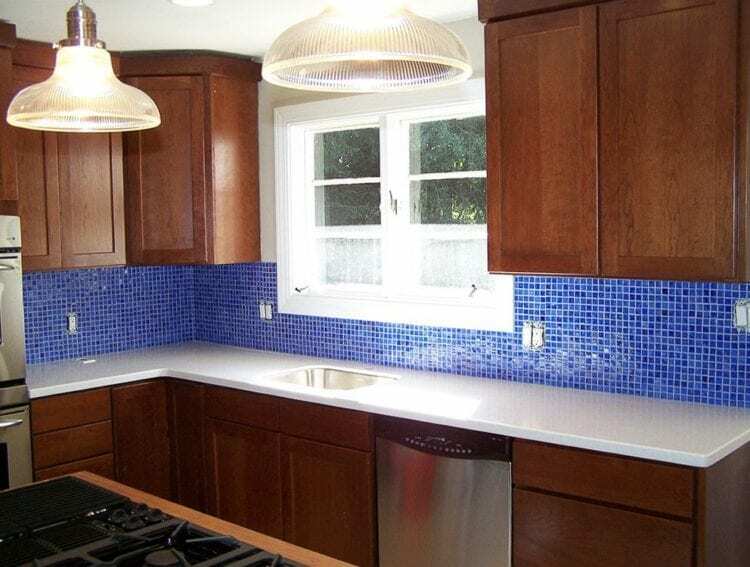 The homeowner combines indigo blue mosaic tiled-backsplash with white cabinets. They result in a captivating contrast. There are a blue kitchen utensil, cooker, and small cabinets, too. The wooden floor and stools soften the sharp lines. Additionally, the white flowers in container jazz up the area. 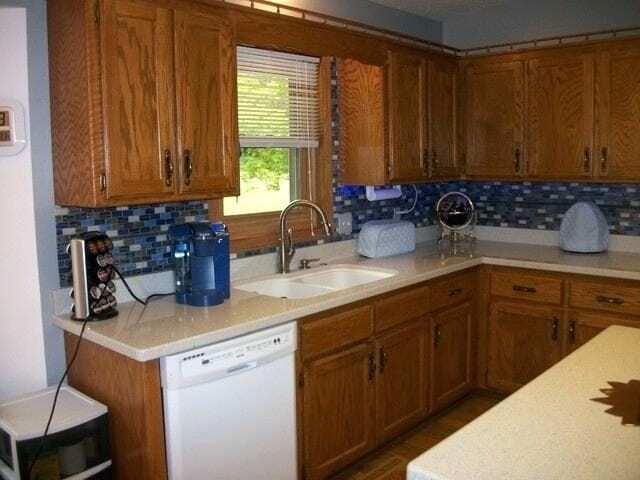 In this version, the blue patterned and subway tiled-backsplash is paired with white cabinets. They draw the eye quickly due to their playful character. The stainless-steel units do not only magnify the industrial chic but also develop a deluxe look. Furthermore, the pink flowers in a crystal vase add a dash of vibrancy and softness to the kitchen. You don’t have to build a large kitchen for a wonderful cooking space. All you need is the eye-pleasing backsplash. It is made up of mosaic tiles in various sizes, blue shades, and shapes. They let the backsplash to be the star of the kitchen. The light also reflects off of glossy cabinet, countertop and stainless-steel appliances. A breathtaking view through the glass window pampers the eyes. Pops of yellow and green brighten up the culinary space. Superb! The granite countertop, metallic units, and wooden built-in storage naturally promote rustic-industrial flair. 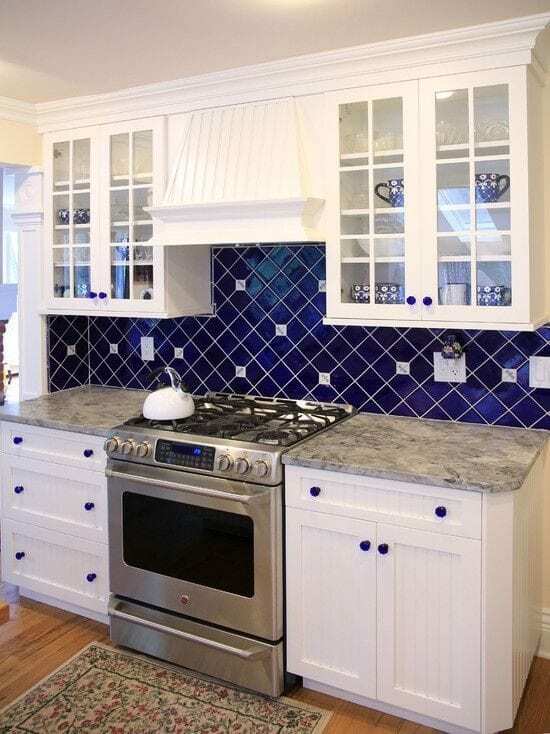 Then, the thin blue subway tiles on the kitchen backsplash add visual appeal to the whole space. A trio of open shelves holds framed artwork and ornaments. 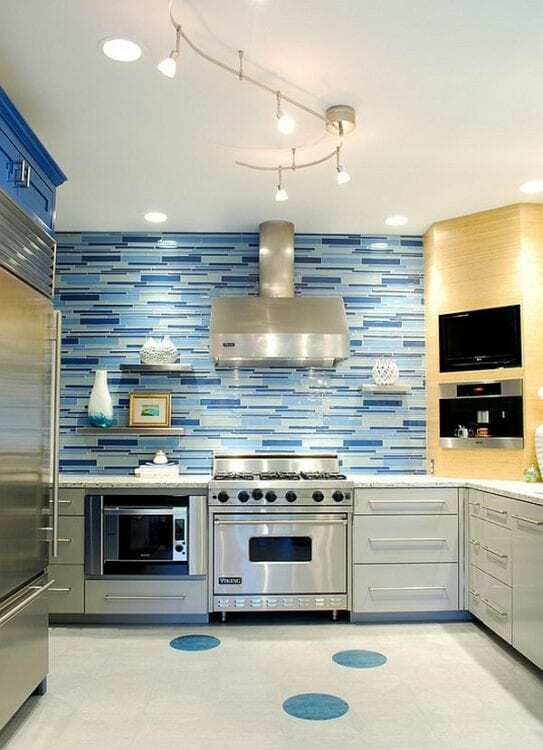 An area rug with blue circles complements the kitchen as well as keeps the backsplash from stealing the show. The ceiling lights offer proper illumination during evening hours. 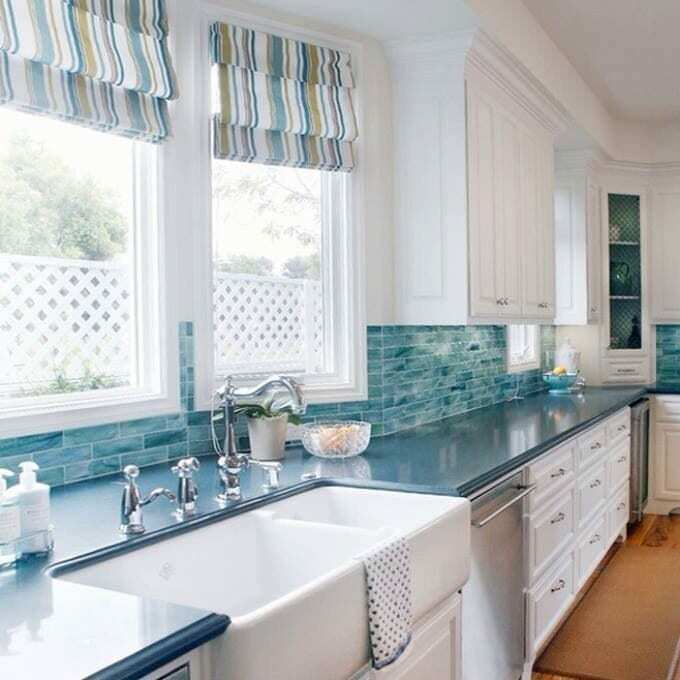 Would you use any of those blue kitchen backsplash ideas? Tell us which one your top pick in the comment is below. Whatever it is, be sure it reflects the unique personality of yours.